Nothing inspires spectacular fandom quite like Star Wars. For nearly four decades, the unfurling saga has had fans of all ages transfixed by its plot, invested in its characters, and mesmerized by a galaxy far, far away. But even the most die-hard Star Wars fan may not know all the secrets behind the cinematic magic that has gone into the movies beginning in 1977. 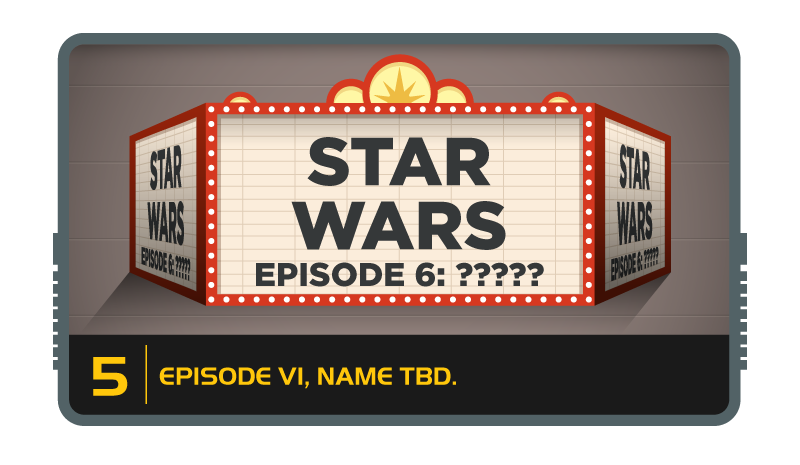 So, we’ve gathered some insider facts that will help elevate you to the highest of levels—the Star Wars megafan. The real troopers in Star Wars: Attack of the Clones—the computer animators behind the scenes! 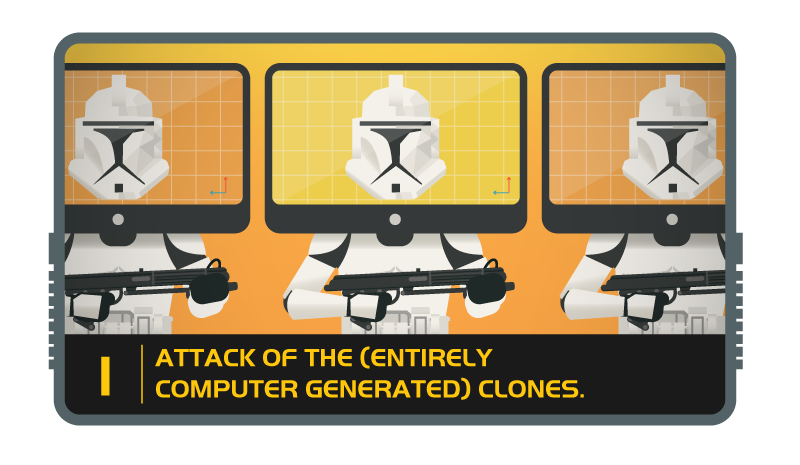 Not a single one of the thousands of clone troopers were ever physically created. Instead, they were all created digitally via computer animation. 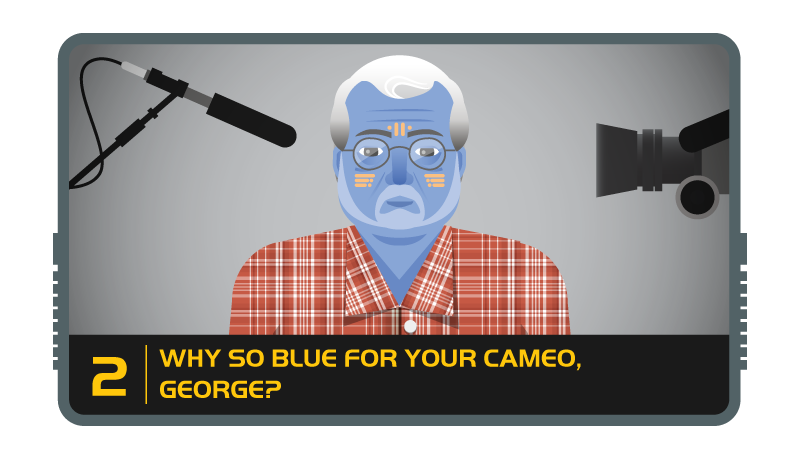 We mainly think of George Lucas as the man behind the camera, but in Star Wars: Revenge of the Sith, the venerated auteur made a brief and stealthy on-screen cameo as Baron Papanoida, a blue-skinned background character. Harrison Ford was originally brought in just to read lines with other auditioning actors after befriending George Lucas on his second feature film, American Graffiti. One other actor considered for Solo? Oscar-winner Christopher Walken! Sometimes a film’s most memorable lines were never even written in the script. 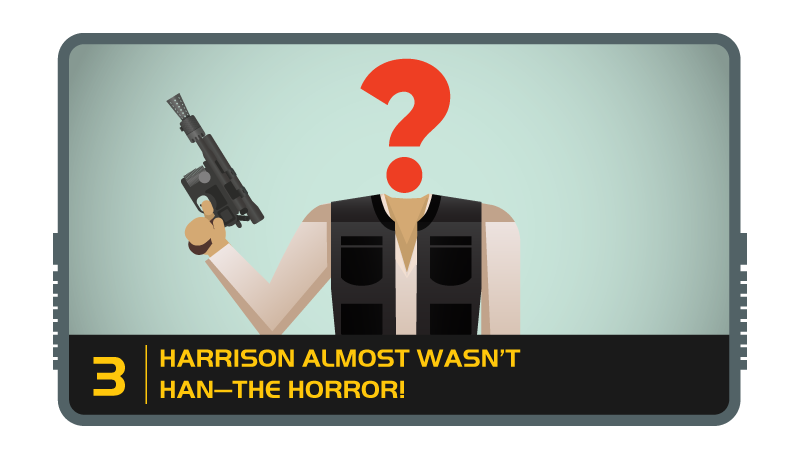 Such was the case with Han Solo’s “I know” one-liner. Far from being crafted ahead of time, Harrison Ford and the director, Irvin Kershner, came up with it on the fly while on set filming Star Wars: The Empire Strikes Back. In the months leading up to the release of Episode VI, the filmmakers went back and forth between the titles Revenge of the Jedi and Return of the Jedi, which they of course ultimately landed on . . . but not before thousands of posters and even a teaser trailer were released with the title Revenge of the Jedi! 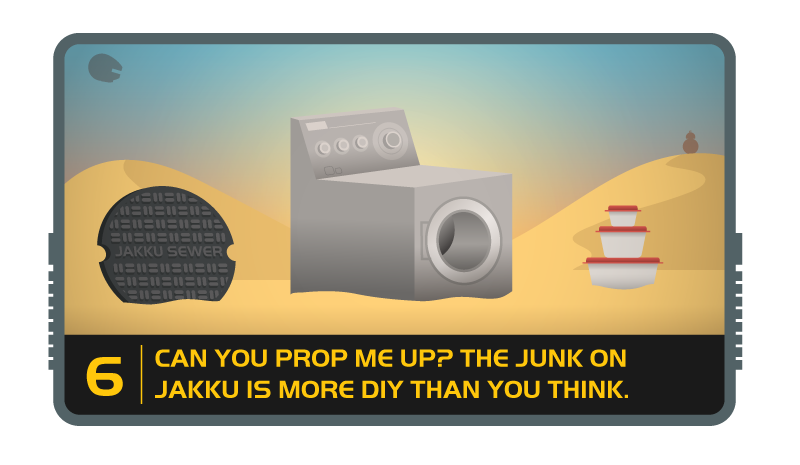 The props that appear in Star Wars: The Force Awakens are comprised of far more than meets the eye. To be exact, 15,000 meters of wiring, about 30,000 LED lights, not to mention Tupperware®, manhole covers, drain covers, and everything from the inside of a washing machine to a rat-catching device. Listen closely, and in each episode you’ll hear a familiar stock sound effect, used in filmmaking since the 1950s. 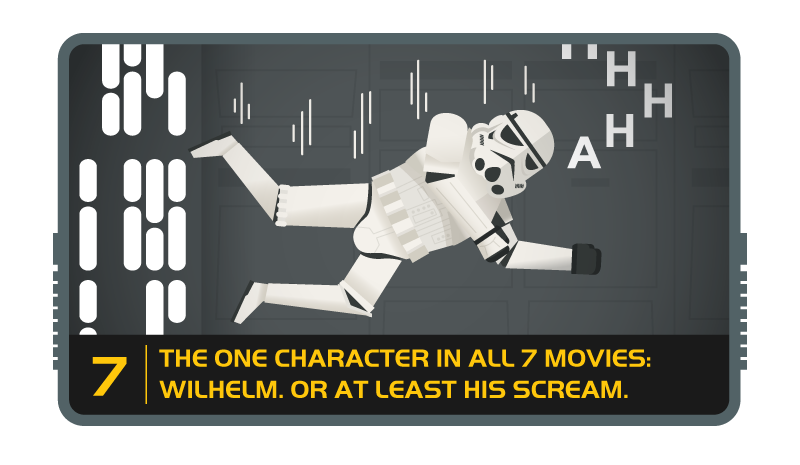 This scream is known as the “Wilhelm Scream” because it was first used in a Western for a wounded character named Private Wilhelm. If you had a feeling that a character “has a bad feeling about this” in each of the films, you’re right. 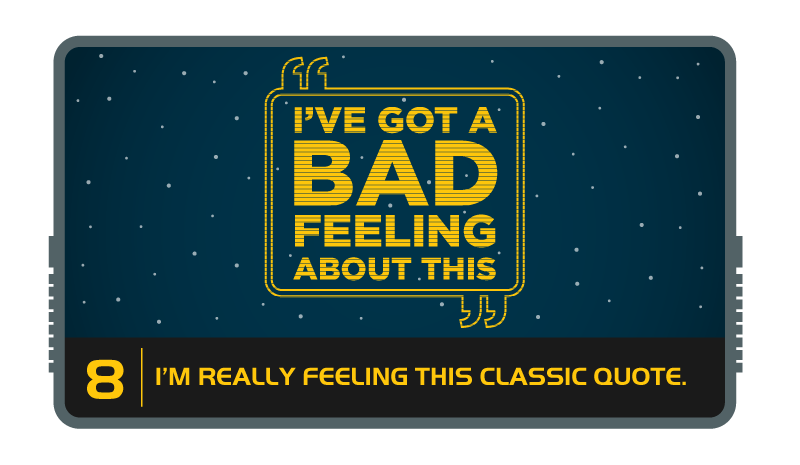 The line, “I’ve got a bad feeling about this,” appears in each episode. 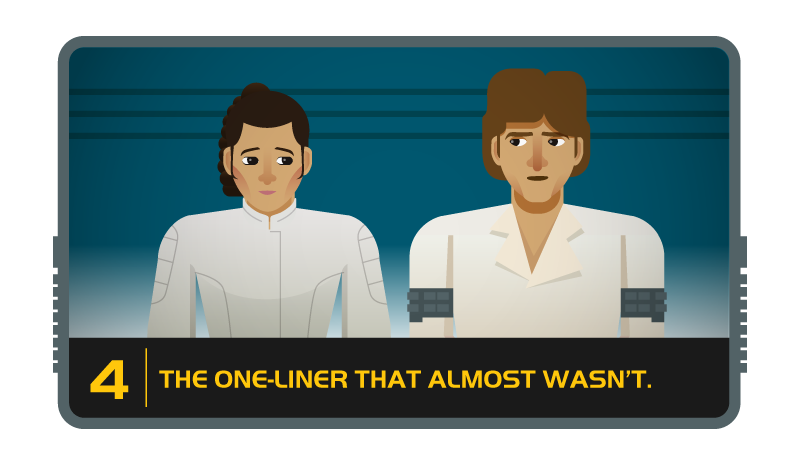 The line was spoken by Obi-Wan twice and Han Solo three times. 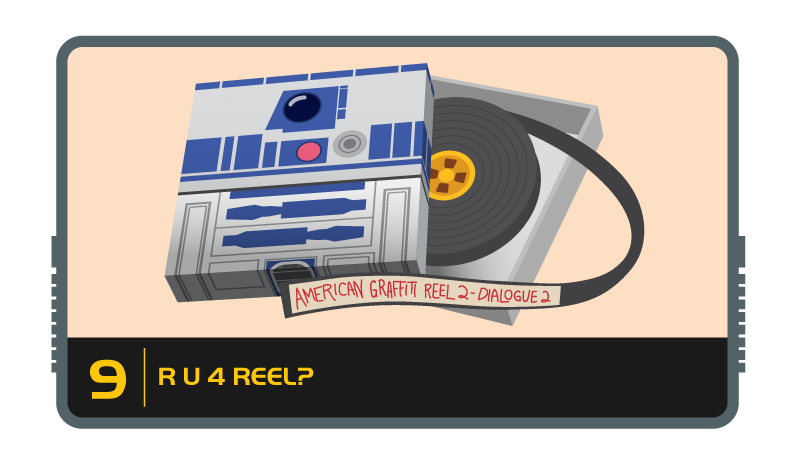 The name R2-D2 stands for “Reel 2, Dialogue 2″—a phrase which emerged while George Lucas and his editor, Walter Murch, were mixing George’s second feature film American Graffiti. Subject to credit approval. You will earn one percent (1%) in Disney Rewards Dollars for every dollar in Qualifying Purchases. You will earn an additional one percent (1%) in Disney Rewards Dollars for every dollar of Qualifying Purchases made at (i) Disney locations that are solely owned and operated by Disney and (ii) at any of the following types of merchants: restaurants, grocery stores and gas stations (for a total of 2% on these purchases). Merchants who accept Visa credit cards are assigned a merchant code, which is determined by the merchant or its processor in accordance with Visa procedures based on the kinds of products and services they primarily sell. Chase groups similar merchant codes into categories for purposes of making rewards offers to you. 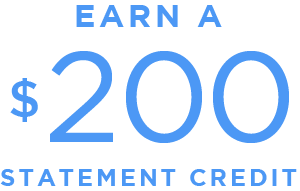 Please note: Chase makes every effort to include all relevant merchant codes in its rewards categories. However, even though a merchant or some of the items that it sells may appear to fit within a rewards category, the merchant may not have a merchant code in that category. When this occurs, purchases with that merchant and the purchases of Disney goods or services at locations that are not solely owned and operated by Disney will not qualify for the additional one percent in Disney Rewards Dollars. Purchases submitted by you, an authorized user, or the merchant through third-party payment accounts, mobile or wireless card readers, online or mobile digital wallets, or similar technology will not qualify in a rewards category if the technology is not set up to process the purchase in that rewards category. For more information, see the FAQs at DisneyRewards.com/PremierEarnFAQ. (“Qualifying Purchases” do not include balance transfers, cash advances, travelers checks, foreign currency, money orders, wire transfers or similar cash-like transactions, lottery tickets, casino gaming chips, race track wagers or similar betting transactions, any checks that access your Card Account, interest, unauthorized or fraudulent charges, or fees of any kind, including an annual fee, if applicable.) Additional terms and conditions that apply to Disney Rewards Dollars will be provided to you with your Disney Premier Visa Card once you become a cardmember.